Don't see the Chrome "Plus" menu? Help and settings is accessible always from any Trello page, even from an open card. Its best to read it before entering Plus spent/estimates. New to Plus Spent and Estimates? Firefox, Safari, iPhone, Android support? Delete or modify an "S/E row"
Look at Preferences in the Help pane for fine-grained control of many features. ★ New to Plus Spent and Estimates? Read typical usage and how Plus tracks Spent & Estimate. ★ Firefox, Safari, iPhone, Android support? Yes! See our Plus for Trello mobile page. Plus makes this very easy. Set a team policy to enter a given minimum Spent per week, say 35 hours per member. From the Chrome Plus menu it takes one click to view the "Spent by User" for the current week. Monitor this report regularly to detect those that are behind. Make sure to check the preference for "background sync" so the report is always up-to-date even if you don't open Trello. Color cells that are under or over specific values. Because Plus keeps track of late spent/estimate entries (entered using -5d for example) in the s/e "note", late entries can be found and filtered in the "note" report column. Go further and generate a Plus "Spent" report every Monday for the previous week, saved into a spreadsheet. Use that data later to determine total Spent per week per member and exclude late entries. Since each report week is "frozen" into a spreadsheet, those entering Spent late will not make it into the spreadsheet. Plus also makes it easy to monitor new team S/E rows, "mark viewed" and be alerted of rows not yet viewed from the Chrome Plus menu. You may also easily monitor all cards in certain lists, labels, and/or due dates across all boards or teams. See reports help below for more information. Plus can do many reports and charts about card counts and sums of S/E/R. View all cards across all boards on a particular list. View total "Remaining" per user to monitor team load, compare 1st and current estimates, filter, group and pivot by many different fields, export and much more. There are also many examples in our help board's Reports an Metrics lists. "Users" is always who entered the S/E. Shows when grouped by "S/E rows", in sort and in the "Spent by user" pivot. It does not refer to users that perform other actions (like creating moving a card) and it does not refer to card membership. More. Historically, Trello had limited labels thus Plus for Trello introduced card #tags to break that limit. They show in the board view. 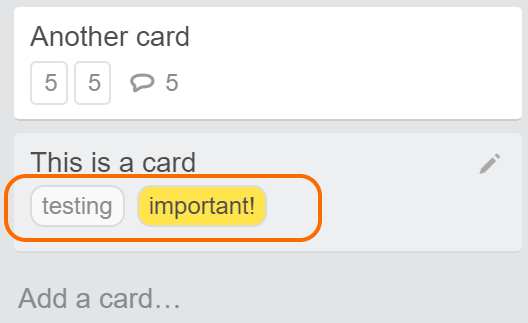 Trello labels only show the label text when you view the card and you might not remember what color means what. Is a global list, unlike labels which are per board. Give you another way to categorize cards along labels. More in the help board. Plus builds the list of #tags based on the ones used by all cards. To rename or remove a #tag, rename in Trello the cards that use them. Find all cards using a given tag by making a report without date filter and filtered by the hashtag (with the "#") in the "card" report filter. Plus supports "standard ISO" weeks starting on Sunday or Monday, and also supports advanced configurations to "shift" the week backwards or forwards by up to a week (for scrum teams that start on Thursdays for example). Excel starts on Monday by default (on some versions) while plus starts on Sunday by default. Change it in Preferences (existing s/e rows convert to the new setting). 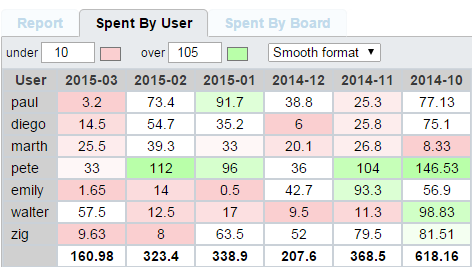 Note that Excel has different implementations before Excel 2010. First, make sure all team members have read and configured the "Sync" section under the Plus help pane. 1. You need to be a member of each board you want to sync, otherwise you won't see the board s/e but others will see yours. Use "Find Boards" in the help pane "Sync" section to show you all boards that you have access (by Trello team permissions) but which you are not a direct member. 2. Team members might have edited an already-entered card S/E comment. This is fixed by resetting sync on each card, or on all boards with "Reset sync". 3. Verify that you have the same keywords as other team members. Also, your header report and home charts might have a keywords filter (see in Preferences). 4. From any Trello board, verify that the Dimensions selector is set to "All S/E". If after these you still don't see s/e correctly, "Reset sync" from Utilities, which will read all the sync data again from scratch. See the next question below for more details. If after a Reset you still don't the information you expected, make sure to configure sync properly. If your team has been using Plus since before 2014 maybe they are still using the "Legacy Google sync" or "Stealth Google sync" method. If so, enable it with the "spreadsheet URL" that your manager will provide. ★ Delete or modify an "S/E row"
Do not modify or delete existing card s/e comments. Instead use "modify" to the right of the s/e report inside cards. Plus will do the math and enter the needed s/e row to make the totals like you typed. See "Entering Spent / Estimate" and "Best practices" in Plus help for more details, and more in our help board S/E basics. You can also enter those directly without using "modify" by entering the differences needed to reach the total s/e you want. If you did delete/change Trello card s/e comments your team needs to "Reset sync" from Utilities to see those changes. To reset a single card instead of your whole file you may instead use the card command "^resetsync" explained in the card "modify" dialog help. If you already use a points/s/e system in Trello (like Scrum for Trello), Plus will show your S/E in boards without any setup needed. Enable sync with "Trello card comments" as the recommended setup. If you do not want to store S/E data in Trello instead use the "Stealth Google Sync" mode which instead stores S/E in a private Google Spreadsheet in your Google Drive. Create a board for trying Plus and later close the board. When you close the board, Plus will sync and mark all that history as "archived" so it wont affect future reports. 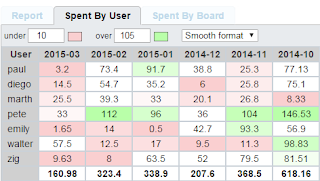 Try card reports, Chrome Plus menu, hashtags, Enter spent and estimates. Use card timers and board burn-downs. To view a meaningful burn-down you will need a few days of s/e data entered. In the card s/e bar, click "now" and select the number of days in the past. If you need to enter s/e past 9 days, pick "other date..." and pick the exact date. Plus will generate a special note [-xd] in that s/e row so you can easily detect rows entered late. There are many ways to separate S/E data. A typical setup is to use a separate list for each sprint. Additionally, use separate "Done" lists or mark cards as "done" with a label so the card does not lose the Sprint position. You may also use card labels or hashtags to identify sprints. In Plus reports and charts, filter cards based on their estimation date by using the report option to "Exclude cards with partial or no E in the Since date range". Thus even if you do not formally classify cards by sprints, you can still view them by the sprint date range as long as you enter the card's first estimate during that date range. More. Those using "Card comments sync" (most users) can switch to that mode and your existing S/E will continue in your reports. Select "Card comments" sync and immediately "Reset sync" from Utilities. Wait for "first sync" to finish. This gives you all your old history back. Change the sync mode to "Stealth". your sync "spreadsheet URL" will still be there. Next sync will read your spreadsheet "S/E rows". Those using legacy Google spreadsheets sync can switch to the Stealth mode without any migration needed and may optionally use Plus help utilities to remove existing S/E from card titles. Pick the user in the s/e card bar. If the user is not in the list, pick "other user...". When you enter s/e for another user (not "me") Plus generates a special note in that s/e row: [by user] whether you used the s/e bar or a direct card comment in the browser or Trello mobile app. All special notes that Plus generates with [brackets] are secure and cannot be faked or removed by other users. 1) Use a "global" user and assign estimates/points or paste a card comment (when using the card comments sync mode) like "plus! @global 0/" and enter the estimate after the "0/". You can later directly spend from that user (if you dont care who did the work) or "transfer" estimates to actual users. 2) Put the Estimate in the card title. Many users that come from "Scrum for Trello" use this method. Those estimates only show in each board page, not in reports or charts. Note that as soon as you assign S/E to at least one user in a card, Plus will ignore the S/E in the card title and will use the "real" user-assigned S/E. Now that Plus supports global estimates and transfers, its much better to use method 1 above instead. As a tool during the estimation period, you may put S/E in card checklist items. Plus shows the S/E sum of all items at the bottom of all checklists. That sum only shows in the card front, and is not taken into account in the board page S/E sums, reports or charts. Once those involved agree on the checklist pre-estimate, add it using one of the methods above or assign to an actual user. Method 1: Use a different first keyword under "Trello card comments" sync. If the rest of the team doesn't use that keyword, they won't see your s/e in reports. You can also use keywords more generally to separate different data on the same team or to classify s/e. With multiple keywords defined, Plus shows an extra list to pick the keyword in the card S/E bar and reports. Method 2: If you are using "Google sync", each user could have their own spreadsheet and only see their work. A manager that wants to see all work could use the regular "trello card comments" sync mode. Note that in this manager configuration, since the team is using the old "google sync", the manager can only use see s/e but cannot modify or enter s/e in the name of team members because they only see s/e in their own spreadsheet. The manager can see their s/e because "Google sync" also writes s/e as card comments. Keywords are a different way to classify s/e or hide s/e from roles that don't wish to see them. You can already classify s/e in many ways (hashtags, by user, by card, labels) but none of those allow to classify s/e within the same card, when users assume multiple roles or don't wish others to see their s/e in reports. Filter Reports, Charts and burn-downs by keyword. Home charts in trello.com can be also filtered by keywords, see Preferences. For example you have three designers and wish to quickly see reports only on design work. You could make reports that include only those users but its impractical or those users might assume multiple roles. You could also use a hashtag #design and put it on all such cards, but sometimes the same card is broad and has users with different roles also working on it. design! dev! test! ux! docs! legal! etc Each team member can configure the list of keywords for the ones they care about. Once you configure multiple keywords, reports, burn-downs, board dimensions and the card s/e bar have an extra "keyword" list to filter. 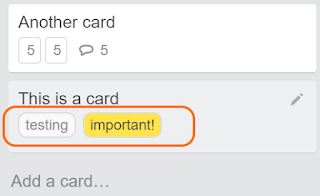 Note that when using different keywords, the s/e card comments are still visible to all users that can see the trello board, thus it is not a secure way to hide s/e from others, just a convenient way to classify s/e or for others to hide it by not having them on their keywords list. Also, keep in mind that "first estimates" currently assume that the same user will not spend from the same card using multiple keywords. If it does happen, reports that filter on keywords and compare against 1st estimates can give incorrect first estimates. Existing team s/e will have the old keyword, since its written inside the Trello card comments. If you really want to change your report history, edit the card comments and "Reset sync" from Utilities. Otherwise, have both keywords in your list. Your new keyword should be the first on the list so it defaults to that keyword on the card s/e bar. This can happen if you zoomed (using Chrome page zoom, for example by using "ctrl +") on a standalone Plus report or burn-down page. Chrome remembers the zoom level per extension, thus it also zooms in-out the Chrome Plus menu. To reset, go to any Plus report or burn-down, then press "ctrl 0" (ctrl + zero) to reset the zoom to 100%. These are all in different sections of Plus help. See there for more details. [R] in a card name makes a card Recurring . [exclude] in a list name removes it from the totals in the board top-right (maybe after you finish each sprint). #hashtag in a card name adds them to the card. GLOB syntax in the Plus menu search and word search in any order when searching cards. comment format when entering s/e directly as card comments. "!" at the start of an s/e note makes a burn-down annotation. Plus parses s/e from card titles as a way to support other systems you may have used like the "Scrum for Trello" chrome extension. It recognizes the "(s/e) title" format, and if you enable "scrum for trello" support (in Preferences) it also recognizes "(E) title [S]". These are used only when the card has no s/e in plus as is meant to preserve your legacy data and not for new data entered in Plus. In legacy "Google sync" mode, plus renames card titles using the format above. "!" negates (NOT) a report filter. AND/OR is also supported. Hover individual filter fields for more. Both extensions display card s/e but use different methods to do so. Plus for Trello can display card s/e that was entered from Scrum for Trello but not the other way around. Users from before 2015 used "Google sync (legacy)". Migrating to the new sync mode is easy and gives you many new features. The only real drawback is that cards are no longer renamed to set total "s/e" inside their title. That feature was mostly useful for mobile use and a crude way to "store" the s/e per card. The new sync method does not rename cards and s/e can be viewed with the new mobile app. Plus also supports a new "Stealth" sync mode that is easier to migrate from legacy. More information. Plus should load almost immediately after Trello. If it doesn't or clicking on Plus links does not navigate, check that you don't have a firewall issue or another extension preventing parts of the Trello page from finishing to load. The bottom of Chrome may be displaying a "waiting" message from the Trello page itself that hasn't yet finished loading fully. On very slow or memory-limited computers, you might want to avoid turning on the Plus preference to "background sync every 10 minutes". If you turn on that preference, Plus will load its database on Chrome startup. Keeping it off will only load the database when you open Trello or the Plus menu directly. On extreme cases of performance issues, you may stop using the Chrome extension and instead use the lightweight mobile & web version for all browsers and phones. Chrome checks for updates about once a day. To force an update right away, see here. See our direct support page. To fully remove, see Chrome help. To just prevent Plus from changing trello.com pages, open the Plus help pane from any Trello page and check the first option at the top of the page "Disable changing trello.com pages". Plus will only add a minimal toolbar so you can get back to the help pane. To reduce memory usage on computer startup, turn off Plus "Background sync" from the Plus help pane in trello.com.